A look at the life of South Asians in the Middle East—from the perspective of a Hindu Indian-American from the Bible Belt of the United States studying at a Jesuit university in an Islamic country. I have seen the plight of people from my motherland, groups of hardworking villagers laboring in blistering heat. Yet I have also seen charity, growth, and understanding. One cannot view this region with a single, lone “Indian” perspective. Really, it’s a tale of at least three Indians: the laborer, the privileged, and the student. 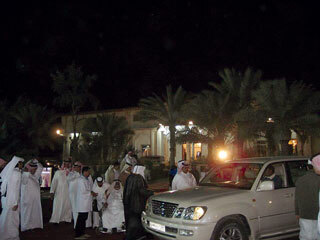 A scene from Al-Attiyah Market. There is no common language in Qatar’s Al-Attiyah Market. The languages (and idiosyncrasies) of Peshawar, Kochi, Colombo, Kathmandu, and Chittagong are all represented on this steamy Friday morning. Men from all over South Asia emerge from their labor camps to get their groceries for the week, to socialize, or even to secretly purchase some moonshine. Tiny shops open, from which the migrant laborers of Qatar can phone their families. Cleaners and builders crowd around a Pakistani man selling kabobs, while others gather around a truck where an Imam preaches Islam in Hindi and Malayalam. As I stand on the rooftop of a building in the Industrial Area, my gaze falls upon this scene. 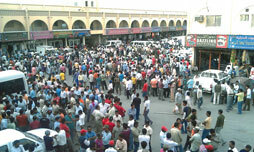 The dense crowds are suggestive of a scene in Calcutta, but this is Al-Attiyah Market, the center of the Industrial Area of Doha, Qatar. In the distance and beyond the haze, one can see the intricate skyscrapers that these people have built. And then there’s me: the Hindu Indian-American from the Bible Belt of the United States studying at a Jesuit university in an Islamic country. Each day for the past year, I have witnessed the wonders of a rich country, the travesties of oppressive companies, and revolutions through the eyes of the revolutionary Arab youth. From the pampering to the injustices, the Ritz-Carlton to the Industrial Area, I have viewed a panoramic shot of this incredible Gulf state. I have seen the plight of people from my motherland, groups of hardworking villagers laboring in blistering heat. Yet I have also seen charity, growth, and understanding. One cannot view this region with a single, lone “South Asian” perspective. Really, it’s a tale of at least three South Asians: the laborer, the privileged, and the student. THE LABORER - Mr. Kumara: The laborer’s story begins in a tiny shack in the south of Sri Lanka. The house has one room for Mr. Kumara and his three children. He is a gravedigger for the local cemetery. His wife works as a housemaid in Saudi Arabia. He showed us the pictures she had sent him from Riyadh. She has to cover herself because she is working in the home of a prominent Saudi family. Georgetown University had flown several of us from Qatar to Sri Lanka for community service and lessons on the Tamil- Singhalese conflict. After journeying from Colombo to Galle, we found ourselves in the hills of the southern part of the island, rebuilding a poverty-stricken village. While working on building Kumara a new house, I would ask him a number of questions. I wanted to look into the window behind which the life story of this individual, the life stories of these people, lay. The only word that registered with him was tsunami. His eyes welled with tears as he recalled the terrible disaster of eight years ago. He could only convey his thoughts, feelings, and emotions to us in a combination of Sinhalese and English. Thrown in was some Arabic that he learned while he was a servant in Kuwait. Kumara is a humble and proud gentleman. He offered what little he had to each of us—many coconuts, bananas, and rice cakes. He would be moving to Qatar soon to earn more “fuloos” (Arabic for money). Kumara is a representation of what migrant workers in the Gulf start from and go back to. It’s a different world. It’s a process that is so difficult to understand—how can people leave their homes and families to work in a place that may be hostile to their way of life, and where they cannot practice their religion? They have to. They need the Gulf as much as the region needs them. In the eyes of every cleaner, security guard, and construction worker, I see Kumara. I see a man who is separated from his wife and children in order to earn enough to pay for his house in his homeland. I see a dignity and pride that the rest of us really don’t quite have. I see this unique sense of ownership that is humbling. Kumara isn’t just a gravedigger living in a tiny shack in a small village. He’s the invisible man who built Qatar. And as I stand on top of a building in the Industrial Area overlooking Al-Attiyah Market, he could be any one of the thousands of brown men below. Kumara now lives in one of the Doha Industrial Area labor camps. His accommodations are average. Rich multinational companies have their labor camps far away with free WiFi and recreational facilities. The worst ones have asbestos on the ceilings, rats scampering about, and overcrowded sleeping quarters. Kumara’s company abides by the minimum standards of labor camp as established by the government. He is able to cook, albeit in a cramped, smoky kitchen. There are four men in his small room, but he can survive. The camps separate the Singhalese from the Tamils, just in case of conflict. On his day off, he goes to Al-Attiyah Market so he can call his wife in Saudi Arabia or his brother back in Sri Lanka. Each morning, he wakes up before dawn to board a bus that will take him to the construction site. He doesn’t know who is going to live in the skyscraper that he builds. He just wants to get to the site, do his work, and return to the camp for a blissful rest. The heat is murderous, but he is motivated by the house he intends to finish upon his return to Sri Lanka. He has not had too much specific training on how to work on the skyscraper, but he uses logic and intuition to do what he must. Unfortunately, that didn’t work the day before—and the wall that the team built has fallen. The managers and supervisors yell at the workers, knowing full well that the workforce was never properly taught how to handle such a massive project. According to the American bosses, the project is already months behind. In the late evening, a tired Kumara boards the bus to go back to his camp. On the way, he looks out the window to see the Land Cruisers and Lamborghinis zooming past. In those cars are the Arab men and women who own this country and his skyscraper. He smiles; in two years, he will be able to return to Sri Lanka to see his family for a few months. He realizes that if he stays instead for four or six years, the vacation will be multiplied, but this decision can be made later. On Friday, he checks his bank account. Once again, the company has not paid the employees, violating government and international law. He is too embarrassed and dejected to call his family today. He wanted to buy a toy for his youngest child, but he still has to pay off the loan for the plane ticket. The company issues a statement, saying that right now, the company does not have funds to pay its workers, but in three months, the laborers can expect the full amount. Until then, work must continue as usual. Frustrated, Kumara buries his head in his hands. He is not mad at the people in the Land Cruisers or the Lamborghinis. He is not disappointed in the country to which he came. His qualm lies with the country from which he came. If his country was not corrupt and had some form of equality, then he would not have had to come here. Dr. Reddy finishes his round of golf with a birdie. Throughout the round, he has been mulling over the decision of whether to bring his family here. In making trips back and forth from Karnataka to Qatar, he has seen how middle-to upper-class Indians live in this country. Seemingly nothing has changed. Indians live amongst Indians, Pakistanis live amongst Pakistanis, Americans with Americans— and the mysterious Qataris are nowhere to be found. In their flowing white clothes, one can really only view them from a distance. According to his friends who have already made the jump from India to Qatar, months can go by without interaction with a member of Qatari society. Scene from a Qatari royal wedding. The alumni from Reddy’s medical college are spread throughout the world. Just a couple of decades ago, the popular idea would have been to go to England, Canada, or the United States; the money was better and the quality of life was excellent. Now, however, the world has changed. India offers a myriad of opportunities for young professionals. At the same time, the doctor is frustrated with the problems of infrastructure and instability in his home. Like the alumni of his alma mater, he decides that going abroad will be the best option for his wife and family. Yet, unlike them, the destination is different. Going to America means assimilation. England is going downhill. Going to the Gulf, though, equates to an Indian life in a comfortable setting. His children can grow up learning Hindi, Telugu, and English in a branch of the Delhi Public School which has opened in Qatar. Reddy and his wife can join an Indian community whose members number in the hundreds of thousands. The money is better, and his medical practice will have ideal facilities. The sun is setting as he drives from the golf course to a friend’s house. As he passes one of the larger construction sites in Doha, he views uniformed South Asian men hard at work, fixing a wall which had fallen the day before. He feels a degree of empathy for them, realizing that the same socioeconomic divisions in Trivandrum or Bangalore exist here; that the Indian society to which he will bring his children possesses the same dynamic as the one back home. They aren’t his problem though. Just like Reddy, these people are coming for a better life. And I have. This hasn’t been your typical study abroad. This is my col-lege experience. Rather than follow the usual route of attending a university in the United States, I accepted a scholarship offer from Georgetown University and the Qatar Foundation to go to school in Qatar for the next few years. 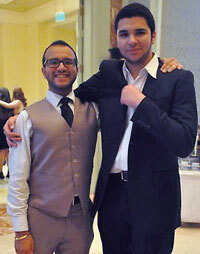 The author with an Arab friend at the Diplomatic Ball, held at the Four Seasons Hotel Doha. And since then, it’s been quite the odyssey. I get to view life in the Middle East through the eyes of an American, an Indian, a Hindu, a Georgian. My friends range from the Pakistanis of Peshawar to Nepalese security guards to Qatari royalty. I’ve gotten to attend a royal wedding, play on the Georgetown basketball team (in Qatar), and curse Hosni Mubarak with an Egyptian flag wrapped around my head. Thanks to the Qatari government, I get the opportunity to live a lavish lifestyle in Education City which starkly contrasts with the norm for young Indian men in the Gulf. I’ve been forced to mature—perhaps faster than I would have wanted. Many of my Indian-American friends at universities across the U.S.A. see college as a way to escape the pressures of Indian parents, to drink and to party. I joke that my decision to not become a doctor provoked my parents to permanently get rid of me and send me to the most turbulent region in the world (where I also can’t easily drink or party). But the entirety of my experience and change has been formulated around the conversations I’ve been blessed to have. I’ve spoken to the Indians who work in the construction site, Iraqis who were harmed in the American invasion of Iraq, and students whose parents have met Osama bin Laden. But the most important component of the conversations I have is the perspective I attempt to bring to the table. People in the region have a hard time accepting that I am both Indian and American. “You are Indian?” they ask. “No, I am an American from the United States.” And the cycle continues. 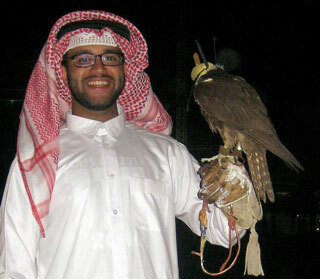 The author mirrors the many contrasts of life in Qatar: (Left) wearing the traditional costume of Qataris, the thobe and ghutra, and (Right) as a member of the Georgetown basketball team in Qatar. In Qatar, you are what your parents are. If you are born in Dubai, but your father is Indian, you are Indian. There is no “Indian-Emirati” or “Indian-Qatari.” So I have been fortunate to approach my experiences in the country with an American homeland and an Indian motherland. My friends who are from Pakistani military families joke that as both an Indian and American, I am as bad as it gets. So when I look for the benefits of lavishness and glamour, I am an American. When I want a discount on a haircut, I am from a village in Punjab. But it’s impossible to be both at once. Identity is an unusual question that has developed into a central component of my college career. This is why I have titled my blog The Southern Fried Kabob. Even with the challenges, I’m lucky to be an Indian-American stuck in the deserts of the Arabian Peninsula. On college campuses in the U.S., Indians typically face an unusual crisis of whether to be in “the brown crowd” or with everybody else. When an Indian guy wants to rush a fraternity, he’s chastised for rushing the Indian fraternity (“He just does that because he’s Indian!”) or even for rushing the typical fraternity (“Oh, he thinks he’s better than the rest of the desis now?”). The culture for the Indian-American student is just so vastly different abroad. In India, we are American. In the United States, we are Indian-American. In other countries, though, the concept just isn’t as clear. In Qatar, this confusion is magnified, seeing as there are more Indians than Qataris residing in the small Gulf state. There’s a key difference between an Indian who was born and raised in the middle class of Qatar and me, though. He will always identify himself as an Indian. He may have been born and raised in the Gulf, may have only been to India once, but he is first and foremost an Indian. Whereas I have found that the most Indian thing about me is my anatomy and my ability to do Bhangra. In classroom discussions, I have discovered that I am an American first. I would be doing my perspective a disservice, however, if I ignored the Indian side. For this reason, I have begun my own research into the migrant labor cycle between the Gulf and South Asia. The stories of Mr. Kumara and Dr. Reddy represent a highly divergent South Asian culture coming into the Gulf. I represent an anomaly given my background, but I am able to culturally and anatomically identify with both of them, while having my life written as an American story. It’s just all a bit tough to explain, but I have come to some broad observations about what it means to be an “Indian in the Gulf.” That concept is not a new one. But it is developing into the world’s largest modern migration of peoples: according to the United States Department of State, over half of the population of Qatar holds a South Asian passport (only 15 percent of the country is Qatari). Unlike any other migration, however, it lacks any form of assimilation. As I journey through this unique college experience, I have come into contact with South Asians, Arabs, Qataris, and Americans who lie all along the horizontal economic spectrum and from top to bottom of the social one. The politically American and culturally Indian approach to life in Qatar is intriguing. It magnifies the idiosyncrasies of each identity, idiosyncrasies which are hidden in the United States. Upon careful examination, I have found that the Sri Lankan worker, the Indian doctor, and the Indian-American student are not the same thing; we cannot be classified as one people; it isn’t even one migration anymore. One is economically oppressed, the other is liberated, and the third is, well, a student. 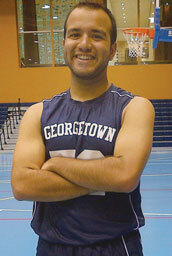 Nikhil Lakhanpal is a second-year student at Georgetown University School of Foreign Service. As a part of a unique scholarship from Georgetown and the Qatar Foundation, he divides his time between Doha and Washington, DC. Note: While Dr. Reddy is a real person whose name has been changed, Mr. Kumara, whose name has also been changed, is a representation of two real people in similar circumstances, one whom the writer met in Sri Lanka and the other whom he met in Qatar.